Just one week until this year’s author dinner featuring Peter Stark, author of Astoria. May 18, 2016. Also a big thank you to all who have and will be contributing to the silent auction items. We are promoting Pink Ribbon Month for the month of May. Come in and check out a pink book to help support Breast and Cervical Cancer Awareness in Central Montana. See pictures on our facebook page. 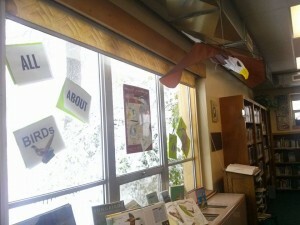 May Non-Fiction Display: ALL ABOUT BIRDS! Come see and enjoy the books on this topic. We love our volunteers! Volunteer highlight! Each week Joyce Swanz and Donna Dengel make their invaluable help available to us. We truly do not know what we would do without them. Joyce helps at the front desk in circulation for two shifts per week while Donna helps out in the stacks by re-shelving books for us. These two lovely ladies are just a few of the folks who make your Library so great!